Circular Quartz Button Earrings from Peru, "Circular Treasures"
Two sterling silver circles are set with faceted stones of clear quartz that total ten carats. Marianela Vargas of Peru designs and crafts these button earrings for a treasured accessory. 1.4 cm H x 0.6 cm Diam. 0.6" H x 0.2" Diam. 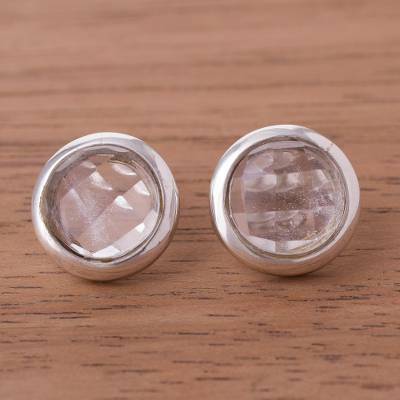 You can find quartz button earrings 'Circular Treasures' by Marianela Vargas in jewelry categories such as Birthstone Earrings, Quartz Earrings, Silver Earrings, Sterling Silver Earrings and Button Earrings. Enjoy exploring these sections for other Novica treasures.